here on our web site or in our periodically produced "New Stone Age" catalogs. will hold the shipment until you notify me that the ordering group is complete. 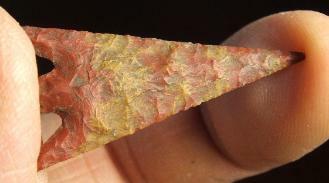 "Scottsbluff" Style Lance or Spear Point -- 2005 A.D.
sharpening and shaping. 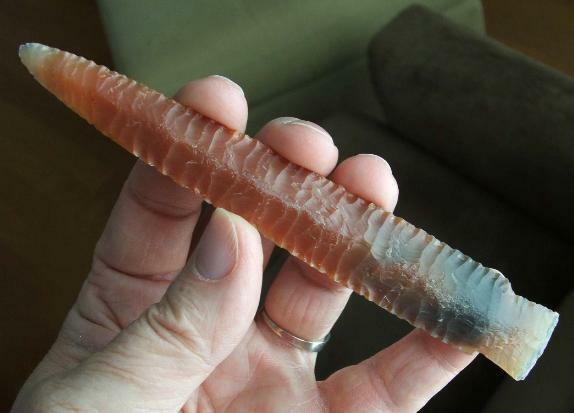 Heat-treated "Agate" from Brazil. Made in 2005 A.D.
"Dovetail" Style Lance Point or Knife Blade -- 2005 A.D.
and exceptional pressure retouching for its final razor sharp edges. Made in 2005 A.D. SPEAR OR LANCE POINT -- 2008 A.D.
at actual size, 8-5/8” x 1-1/2”. 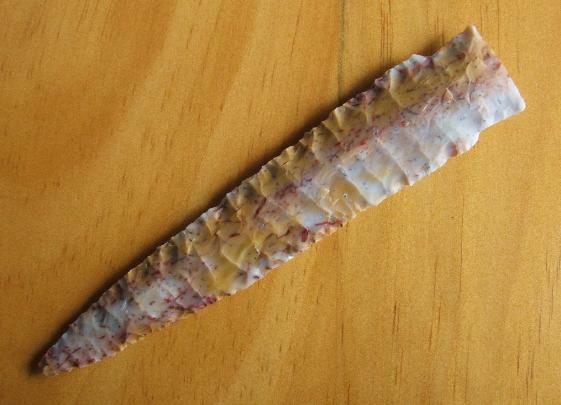 "Clovis" Style Lance or Spear Point -- 2004 A.D.
shaping and sharpening with pressure retouch flaking. Front flute extends to 2" from base, back flute to 2". shaping and sharpening with pressure retouch flaking has been completed. Front flute extends to 2-1/4"
from base, back flute to 1-5/8". 5" x 1-1/2". 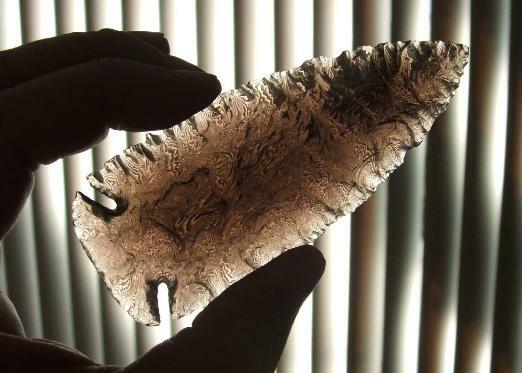 Made of "Midnight Lace" Obsidian from Glass Buttes, Oregon. 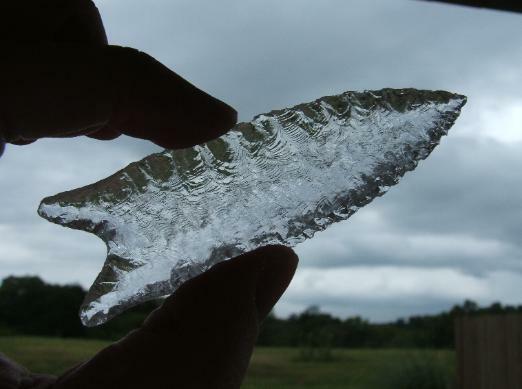 Crystal "Dalton" Spear Point -- 2007 A.D.
"Scottsbluff" Style Lance Point or Knife Blade -- 2007 A.D.
pressure retouching to its final razor sharp edges and classic shape. 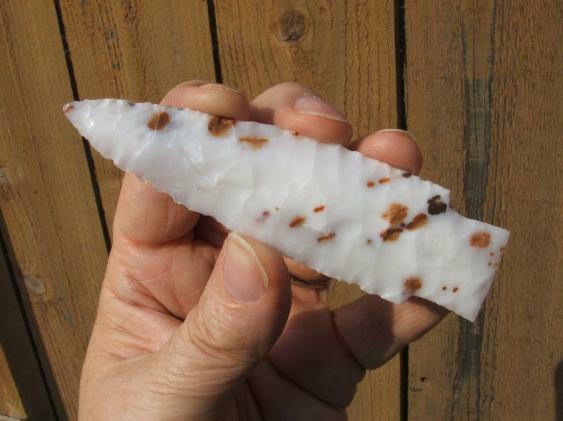 Made in 2007 A.D.
Paleo Indian "Scottsbluff" Style Gemfield Jasper Lance Point -- 2008 A.D.
point. Made of heat treated, colorful Gemfield Jasper from Nevada. Made in 2008 A.D.
5-1/16" x 1". #FSC-55B $249.95.